The Iconic Houses Network will hold its bi-annual international conference in Norwalk, CT, in the New Canaan area. Supported by lead sponsor American Express, the conference is retracing the root taken by Modernism on the East Coast of the USA when it arrived from Europe. In particular, the New Canaan area has an impressive number of high-quality Modernist homes because the architects who taught at Harvard built houses for themselves and their friends here. Many are the work of Philip Johnson and the architects of the Harvard Five. These unique homes will be the focus of the lectures and conference house tours. 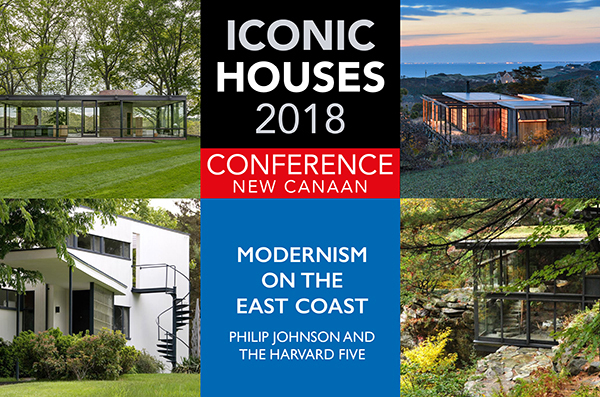 The first general conference afternoon (Thursday, May 17) includes tours of Philip Johnson’s Alice Ball House, the Boissonas House as well as a guided tour of Johnson’s own iconic Glass House (1949), where New Canaan is naturally mainly associated with. The second afternoon House Tours (Friday, May 18) will lead to four significant private masterpieces, designed by architects from the Harvard Five, such as the family home of Eliot Noyes; the Gores Pavilion by Landis Goris; and the John Rayward House, Tirranna, (Frank Lloyd Wright, 1955; tentative subject to sale). The Pre-Conference House Tours (Wednesday, May 16) includes guided tours of the Marcel Breuer House in the Pocantico Hills of Tarrytown; Russel Wright’s home and studio ‘Manitoga’ in Garrison; the Usonia community and the Roland Reisley House (Frank Lloyd Wright, 1951), a Usonian Home in Pleasantville, New York. There’s also a three-day Post-Conference trip to the modest Modernist holiday homes on Cape Cod which also takes in Cambridge and ends with Boston’s Gropius House (Saturday, May 19 – Monday, May 21). Tours on Cape Cod include houses designed by Serge Chermayeff, Jack Hall, Paul Weidlinger and Charlie Zehnder. Stay tuned for regular updates and sign up for our monthly newsletter.